The very first magazine subscription I ever had was to Boy's Life. Although the exact details have grown murky with the years, I'm guessing I started receiving it around the time I joined Cub Scouts, which would have been 1970-ish, and continued with it until I aged out of Webelos in the mid-1970's. Boy's Life was a "gateway drug" for the outdoor magazines I read to this day, with feature stories on outdoor adventure, travel, hobbies and the like. There were also several pages of classified ads at the back of each issue, and while the items listed for sale in these ads changed very little over the 5 or 6 years I received the magazine, I always made a point of checking them out anyway. For $1.00 (plus 25 cents postage) you could get a live chameleon and 100 meal worms, or for $2.75 you could get four fresh-caught seahorses, including a pregnant male. The chameleon seemed like a better deal, but you certainly cannot discount the value of a pregnant male. Knives were apparently big sellers, too. One ad regularly promised TWO lock-blade knives for the low, low price of $1.98 (plus 50 cents shipping). Even by the standards of the early 70's, two knives for less than the price of four seahorses was quite a deal. While knives, live animals, and nature crafts had legitimate appeal to the naturalists and outdoorsmen among the scouts, many of the items were clearly just targeting adolescent boys. One ad touted a "Blood Curdling Bag Full of Horrors (They Obey Your Commands)" for a dollar. This "bag" consisted of a "jumping octopus," a "peeping skeleton," a "hideous shrunken head," and a "blinking eye." I have no idea how they "obeyed commands," since they were obviously cheap plastic novelties like the kind you could get from a gumball machine for a quarter. There was also a 7 foot tall "monster" for the low, low price of $1.00 (plus 50 cents shipping and handling). Although many of these items were of interest to me, I never actually ordered any of them. I didn't have a lot of disposable income at the time and even then, as naive as I was, I had a hunch that a 7 foot "monster" that cost a buck probably wasn't much to look at. This article was written about me for a June 2014 edition of a now-defunct local newspaper. While some of of the information is obviously dated (has it really been four years!?!) 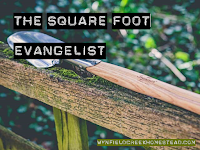 I thought I would re-post it this week as I start another season of Square Foot Gardening Talks and Demonstrations with my appearance Thursday at H.W. Little Hardware in Wadesboro. At the call of “Adventure!,” Laika, a two-year-old white and black terrier mix bounds enthusiastically from the adjoining room where she had been stretched out on the sofa. 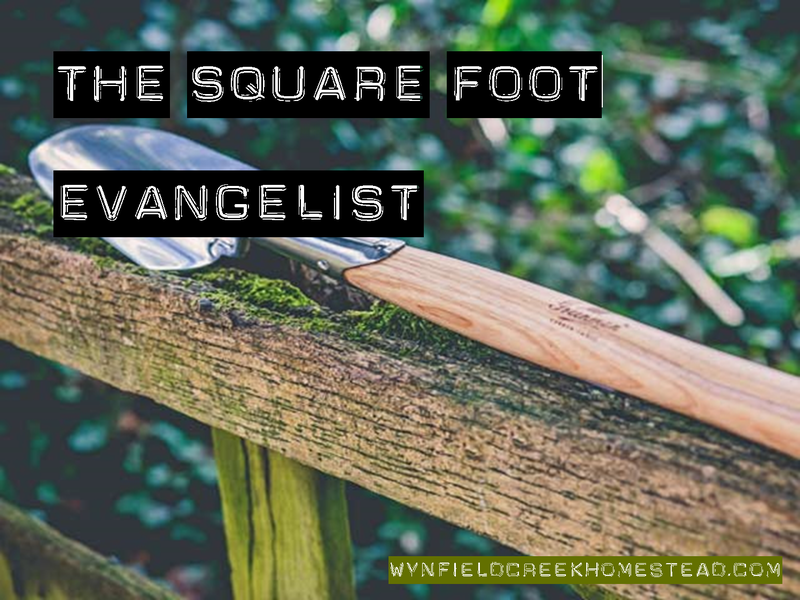 It’s Saturday morning in the Wynfield Creek home of Square Foot Gardening guru John Marek, and I’m here to talk with him about his latest community development project, Square Foot Gardening-Lake Norman, but it’s apparent that this isn’t going to be the typical “views and snooze” interview. “You’re wearing hiking boots… good,” he says as he motions me through the garage door and toward his vintage Jeep Wrangler, Laika wagging happily along beside. “Last brand-new car I’ll probably ever buy,” he states, nodding toward the late-model Honda CR-V left behind in the garage as we back out. “The new car thing has gotten ridiculous. Our neighbors bought a Ford Edge and it has variable-color interior lighting. 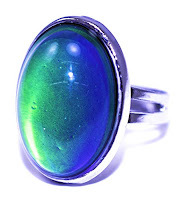 You press a button and the interior turns from green to blue to orange. Like my dad used to say, ‘just something else to go wrong.’ This old Jeep doesn’t have anything extraneous; everything serves a purpose. It’s solid and functional and timeless.” The same could be said about the man behind the wheel. Nearing his 52nd birthday, Marek exudes a boyish enthusiasm and casual wit that befit a man ten or more years his junior. John Marek was born in Port Clinton, Ohio, a town of 7,000 on Lake Erie, roughly midway between Cleveland and Toledo. His father worked at the US Gypsum plant a half mile down the road from the family home, and his mother worked part-time at an elementary school a half mile in the other direction. “Between them, I don’t think my parents ever made more than $20,000 in a year, so we were definitely lower, lower middle class, and that’s probably being generous, but I never felt poor. Mom and dad were so good at managing money; I never felt like we had to do without anything we really needed… and of course, there was the garden. That was a big part of making ends meet.” As far back as he can remember, Marek helped his father maintain a vegetable garden that took up the entire back fifth of their yard. “Dad was great with tomatoes, peppers, squash, potatoes and beans. One of our favorite summertime meals was fresh green beans and potatoes with bacon. Mom would cook up a huge pot of it, slice up some fresh tomatoes and we’d have a meal or two for the cost of a quarter-pound of bacon.” Those lessons of frugality and self-sufficiency would become an integral part of the younger Marek’s character, and would eventually become the basis for his efforts to spread the gospel of Square Foot Gardening. We tend to think of political correctness in schools as a relatively new concept, but the truth is that many of its elements had already seeped into our educational system by the mid-1960's, sometimes with unintentionally hilarious results. 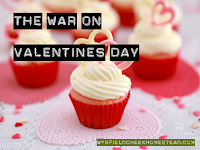 When I attended Immaculate Conception elementary, starting in 1967, a particular (and peculiar) rule about Valentine's Day had already been in place for a couple of years, at least: In a nutshell, anything you did for one person had to be done for your whole class. My mother was a world-class baker, and just about every year she made special Valentine's cupcakes for me to share. (Which by the way, I understand is no longer permitted.) They were white cake with either pink or red icing and a small piece of mellocreme candy in the shape of a cherub or heart on top. In that case, the rule was understandable; it wouldn't be right to bring in cupcakes for just a select few classmates. Where things got a little dicier was with regard to "Valentines," the little cards that you would give out, theoretically to girls (or boys or whatever; not judging here) you liked. If you look at boxes of Valentines today, they are pretty non-specific, with pictures of Frozen characters and Transformers and sports teams on them. Many don't even mention the word, "Valentine." It's not a big deal to give your 2nd grade buddy Bill a picture of a Transformer and have him give you back a picture of Cam Newton. But it wasn't exactly like that in 1967. St. Valentine is the Catholic patron saint of "courtly love," and pretty much all the available Valentines back then took that theme more-or-less seriously, so you wound up giving your buddy Bill a red heart with an arrow through the words "Be Mine," and he gave you a picture of a diaper-clad infant holding a bow and arrow and proclaiming, "Love." There wasn't inherently anything wrong with that, of course, but it was just a wee bit outside the typical range of interactions between 8-year-old boys, at least so far as I can recall. Even further down the scale of appropriateness was the fact that we often gave special Valentines cards to our teachers, who were... uhmm... nuns. Looking back on it... I mean, if a teacher today were found to be in possession of a card given to them by a student which proclaimed some of the sentiments professed in cards I gave to women of the cloth, there would be, at a minimum, a thorough investigation. What can I say, it was a more innocent time. My father, Bennie, was a voracious reader. Every night after coming home from work and completing his outdoor chores he would sit down with both the local papers, the Port Clinton News Herald and the Sandusky Register and read them pretty much cover to cover. Dad also had a taste for tabloids like National Enquirer, Weekly World News and Star. About as close as he came to an actual book was the Old Farmer's Almanac. From as early as I can remember, the distinctive yellow booklet was a fixture in our household. Sometimes it just sat in the pile of other "reference" books on the kitchen counter, but sometimes dad would hang it from a nail in the mudroom where he sharpened his pencils and put on his boots before heading to work every morning. By the time I was 8 or 9, and with entertainment options in rural north-central Ohio somewhat sparse, I decided to have a look for myself. At that point in my life, I knew the Almanac primarily from the semi-mystical pronouncements dad would make referencing it; "Going to be a cold January, according to the Almanac, but February should warm up a little," or "I guess we'd better stock up on coffee, Almanac says prices are going to double this year." When I actually got around to pulling the book down off the nail, the appeal for me was a little different. 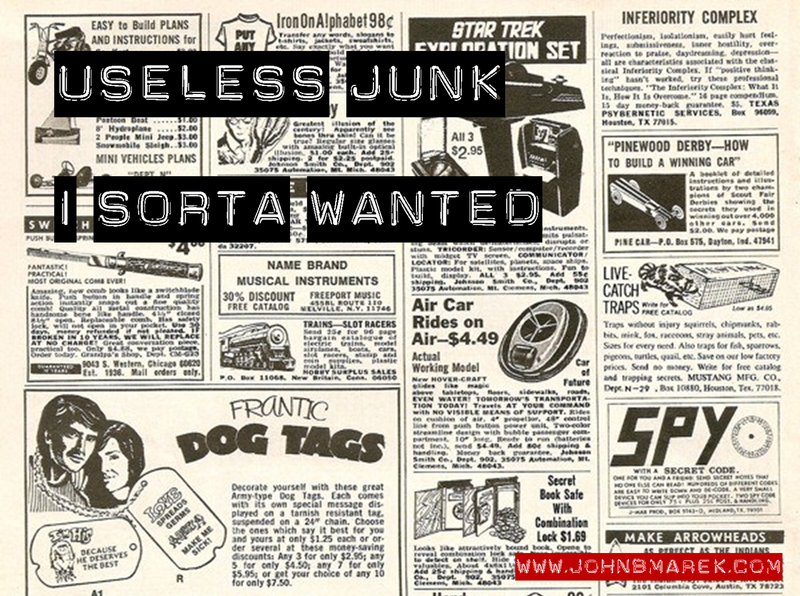 I had always been fascinated by ads; magazine, newspaper, TV, heck, even the junk we got in the mail. 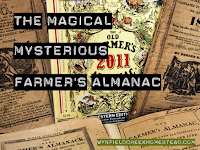 The Old Farmer's Almanac is a veritable treasure trove of ads, and not just any ads. Ads for weird and exotic (to an 8-year old Midwesterner) products that you would never see in the Toledo Blade or even Weekly World News; automatic apple peelers, food dehydrators, and various types of oils, lotions and jewelry that helped improve your luck! 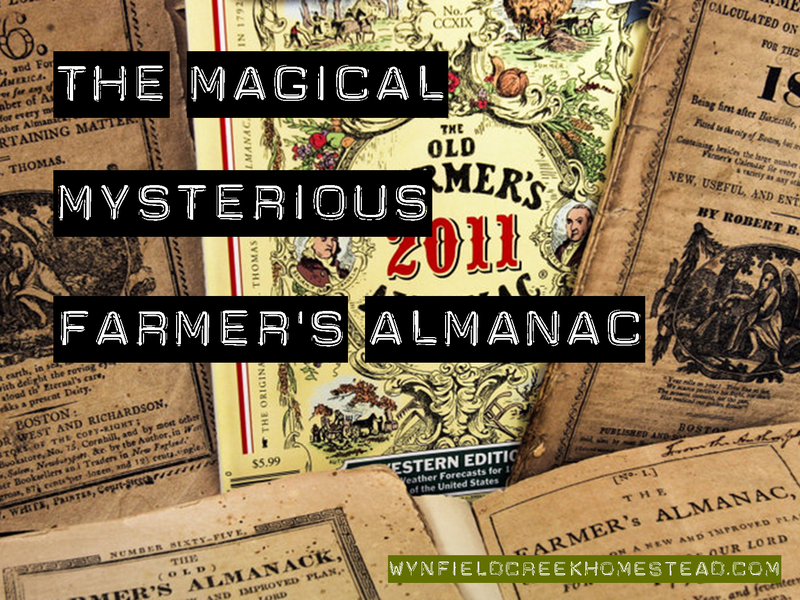 I still pick up an Old Farmer's Almanac every year between Thanksgiving and Christmas. It's a wonderfully anachronistic relic in this age of iPhone and 24-hour weather channels. I no longer read it cover-to-cover the way I did as a kid, but I still skim through it on cold, dark winter nights seeking a little bit of old fashioned agrarian insight.